https://sep.yimg.com/ay/yhst-33477391359232/anchor-coral-euphyllia-ancora-ridge-anchor-hammerhead-anchor-coral-hammer-coral-wall-coral-9.jpgAnchor Coral - Euphyllia ancora - Ridge Anchor - Hammerhead - Anchor Coral - Hammer Coral - Wall CoralModerateAggressiveYesCalcium, Strontium, Trace elementsIndo-PacifcCaryophylliidaeSmall 2" - 3"
Anchor Coral is one of the must haves in a marine aquarium. Being manageable by the aquarists of all the expertise level, across the board, Anchor Coral gives you true value for your money. 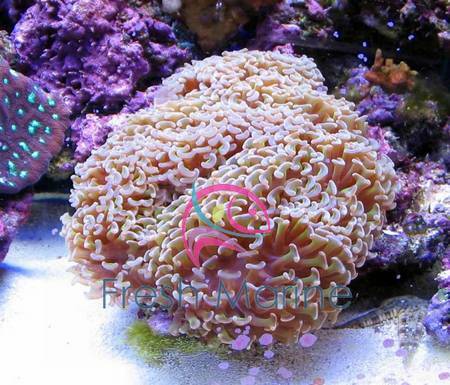 Its beautiful looks and its ease of maintenance catalyze Anchor Coral�s popularity. Anchor Coral is a certain entrant in every marine aquarium at the first few introductions itself. Other names: Anchor Coral belongs to the Family Caryophyllidae, Genus Euphyllia and Species ancora. The scientific name of Anchor Coral is Euphyllia ancora. The other common names of Anchor Coral are Hammerhead Coral and Ridge Coral. Coral Type: Anchor Coral is a Large Polyp Stony Coral (LPS). Origin or natural range: Euphyllia ancora originates in the Indo-Pacific islands including Fiji, the Great Barrier Reef, Tonga and Solomon Islands. Color: Anchor Coral occurs in the variations of blue, gray, orange, green, brown and cream. Morphology: Anchor Coral is colonial in nature with each colony extending for around one meter. Euphyllia ancora forms continuous colonies and the collective length of the colonies may extend till quite a few meters. The polyps of Anchor Coral extend from a delicate skeleton resembling a cup. The polyps of Euphyllia ancora have large sweeper tentacles with anchor or hammer shaped tip and therefore the names Anchor Coral and Hammer Coral. Euphyllia ancora is nocturnal in its habits and the tentacles of Euphyllia ancora extend to around six inches in length at night. Sweeper tentacles defend Anchor Coral against any other coral colony encroaching the area of Euphyllia ancora. The tips of the tentacles have white colored nematocysts that have strong venom and can therefore, hurt the other weaker members of your marine aquarium. Compatibility: Anchor Coral is aggressive towards the other marine aquarium invertebrates. Habit & Habitat: Anchor Coral, a not so commonly occurring species, is found in shallow water on Lagoon Reefs in the Indo-Pacific region. Breeding: Anchor Coral propagates easily in a marine aquarium by the means of fission. Fission is a form of asexual reproduction and each resulting fragment is capable of growing into an individual Anchor Coral. Temperature: 72 to 78 degrees Fahrenheit. Illumination: The marine aquarium hosting Anchor Coral should have moderate to high indirect lighting. High intensity light catalyze the growth and the coloration of Anchor Coral. Metal Halide lighting is recommended. Bright fluorescent lights are also good. Water flow in the aquarium: The water flow in the aquarium keeping Anchor Coral should have indirect moderate water current. Marine aquarium habit & habitat: Place Euphyllia ancora at the bottom of your marine aquarium on a hard rock rather than on sand. Give Anchor Coral ample space to extend itself well in your marine aquarium, that is, keep the other corals away from Anchor Coral. Feeding & Nutrition: Anchor Coral derives its nutrition chiefly through photosynthesis being performed by zooxanthellae, a photosynthetic alga living symbiotically inside Euphyllia ancora. Anchor Coral is also carnivorous in its feeding habit owing to which it filter feeds, one or two times per week, on frozen meaty bits of shrimp, squid and fish, phytoplankton and zooplankton. Add Calcium, Strontium and trace elements to the water as dietary supplements. Anchor Coral requires moderate care. Do maintain high water quality in your marine aquarium to prevent Anchor Coral from falling prey to the brown jelly disease. While mechanically culturing Anchor Coral, take care when fragmenting it because Euphyllia ancora is quite delicate. Keep Anchor Coral away from the other corals because its sweeper tentacles may hurt those tank mates that are weaker than Euphyllia ancora. The tentacles secrete a poisonous toxin.